Learn how to grill vegetables to make a satisfying and tasty addition to your BBQ party. There’s no need for vegetarians to feel left out when gathering with friends around the grill. From easy grilled vegetables to designing your own marinade for grilled vegetables, here are all the grilling vegetables tips you need to get through the Summer. Hands down, one of the most relaxed and enjoyable ways to eat food is by gathering with some friends or neighbors to throw some things on the grill. However, the grill is a place where people are often tempted to make very healthy choices. Usually, some cheap hot dogs get slapped onto the grill next to some monstrous, grease-dripping hamburgers slathered with even greasier cheese. That type of artery-clogging, waistband-expanding experience may not be your idea of fun. Just because you have committed to eating healthier, you should not have to miss out on the joy of barbequing. Nor should you feel like the weirdo health nut who the others feel pressured to accommodate. You can share a leisurely and informal lunch or dinner by making some creative choices about how to grill vegetables. After you try out and share a few of these delicious and simple ideas, even your most die-hard meat eating friends may start enthusiastically grilling up more veggies! Most veggies take much less time to cook than meat does, making veggies a quick and easy grilling option. For people who are not used to grilling vegetables, a helpful hint to begin is to turn down the flame. A harsh, full-on fire that you would use for most meats will easily char the delicate skins of most veggies, and the last thing that most of us want to taste is ash as opposed to the succulent flavor of the vegetable itself. For some vegetables, it makes sense to place them whole on the grill, like a red pepper or some small round squashes. Other vegetables, for example a large head of broccoli, will need to be cut up to get it to cook thoroughly throughout. Sometimes smaller pieces of vegetables may fall through the metal grilling grate. To get around this, you can invest in a grilling wok, which is basically a wok that you can place right on top of the grill. You can then cook all sorts of smaller veggies and even make a complete stir fry on the grill, sauce included. If you don’t have a grilling wok, another easy way to grill vegetables like peas or green beans is to wrap a bunch of the smaller veggies in aluminum foil with some oil. Set the entire package over a low fire, and in a few minutes they will be ready. Grilling vegetables doesn’t get much more simple than this! It is important to know that vegetables have a tendency to dry out quickly on the grill, which brings us to our next veggie grilling tip – the magic of marinades! A marinade can turn an otherwise plain veggie into a gourmet treat, and your friends will be begging you for the recipe! A marinade is a dressing-like cream or liquid that can be made up of oils, vinegars, juices, and any spices or flavourings that you want. You can either soak the veggies ahead of time in a marinade to try to infuse them with certain flavours, or it can be something that you can brush directly onto the veggies as you are grilling them. Marinades are great because you can start to get creative and play around. Because veggies dry out on the grill and may stick to the grate, a little oil is the foundation of the best marinade for grilled vegetables. Extra virgin olive oil has a lower smoke point than most oils, so try virgin or pomace rather than extra virgin. Avocado oil has a soft nutty flavour and a high smoke point that makes it an excellent choice for cooking at high temperatures. Feel free to experiment with other oils that give more diverse flavours, such as macadamia, hazelnut and walnut oils. A simple marinade for grilled vegetables that always tastes spectacular can be made from mixing some finely chopped fresh garlic, a squeeze of lemon, a little sea salt, and as many chopped up fresh herbs as you can get your hands on. Add these to your oil base. For a little more kick, add some finely chopped chilies or some fresh ginger. For a refreshing and zingy marinade for grilled vegetables that is great for summer, try making a mixture of olive oil, orange juice, grated lemon zest, fresh cilantro and some red pepper flakes. A splash of coconut milk is a great way to mix up this recipe to make it taste totally different yet just as delicious. For an Asian flavoured marinade that is well-suited to broccoli, peppers, greens and asparagus, make a mixture that includes some soy sauce, rice vinegar and lots of fresh ginger. Add a little sesame oil but be aware that this oil has a very strong flavour and you’ll only need a small amount. A lightly flavoured oil such as rice bran oil is a good choice to pad out the base of an Asian style marinade for grilled vegetables. Take the liberty to experiment with how to grill vegetables, as you never know what you may come up with by accident! There is no right or wrong, and remember, cooking healthy should be fun! All vegetables can be grilled, but some vegetables seem to be made for grilling! Broccoli and cauliflower both take on a satisfying texture when crisped up a little by the grill. Asparagus, especially when drizzled with a little olive oil, is a great grilling choice. Potatoes can also work well. Wrapped in aluminum foil they will take approximately the same amount of time as some meats – but don’t forget that you can mix it up and grill sweet potatoes or yucca just as easily! Zucchini, squash and eggplant can be sliced into long, thin strips and make a healthy choice to throw on the grill. Carrots are a surprising choice, but they actually grill up well and add a pop of intense color to any meal. 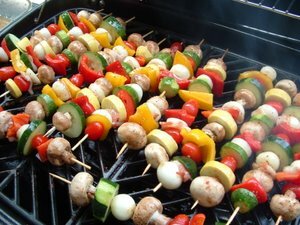 Another way to make easy grilled vegetables is to cut various veggies up into large chunks and thread them on skewers. These can be turned on the grill for even cooking and the colours look fantastic presented on the table. Remember to pre-soak wooden skewers for at least two hours before threading on the vegetable chunks, or they’ll catch alight before your veggies have finished grilling. If you use metal skewers, watch out that you don’t burn your mouth as they hold the heat for a long time after being removed from the grill. Some of these ideas on how to grill vegetables may appeal to you already, but as you are visualising everyone else filling themselves up with a hamburger or huge piece of steak, a plate full of grilled veggies may not sound like enough to really satisfy you. Try a large, marinated portabella mushroom in place of a hamburger. You can put it on a hamburger bun and dress it up as you would a burger. Mushrooms have a meaty texture and earthy flavour, so this is something that even meat eaters may enjoy. A great idea that includes a lot of protein is to stuff a thick-skinned veggie such as a red or green pepper, shelled-out large round zucchini, or small pumpkin squash. Fill any one of these with a pre-cooked mixture of lentils and brown rice, garbanzos, and fresh herbs, chopped onion and garlic. Drizzle them generously with olive oil and put them over a medium flame until the outer shell begins to soften and the ingredients are heated through. During the last few minutes, top with a soft, meltable cheese, and you have a hearty meal that will impress anyone who thought that grilled veggies had to be boring! Now you have the basics on how to grill vegetables you can try new things and see what you can come up with! You may soon find that your delicious and healthy creations are popping up at barbeques all around your neighborhood!